The Shabby Stamper: The first annual Knobbly Gnome Walk!! The first annual Knobbly Gnome Walk!! I've had so much fun Knobbly Gnomes over the years and I thought that I'd post a couple of my favorite Gnomes for others to enjoy -- the First Annual Gnome Walk! 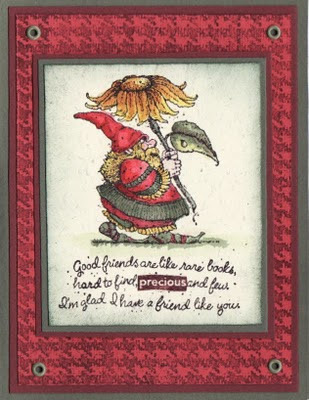 I'm going to post one new Gnome each day, so be sure to come back to visit if you want to see some of my garden friends. This card was a direct case from the catty, the year that Knobbly Gnomes was introduced. Beautiful water coloring. Very talented! oops I posted before I said how much I love this card. I think this background stamp is great with the stamp. The colors are a great combo. I love this set and will never let it go. Great card and the watercolouring is wonderful. I was never a fan of the Knobbly Gnomes sets, but I have to tell you Lisa, your watercoloring makes me wish I had the set now. Beautiful job! PCS Garden Lantern hop + a preview! Welcome to the PCS Garden Birdhouse Hop! Knobbly Gnome Walk -- day three! The First Annual Gnome Walk, day two! !